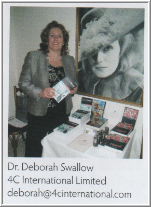 How to Present Internationally: avoid pitfalls & be a success « Dr Deborah Swallow – Global Cultural Diversity.. This entry was posted on Wednesday, August 19th, 2009 at 7:27 pm and is filed under cross-cultural communication, cross-cultural differences, General . You can follow any responses to this entry through the RSS 2.0 feed. Both comments and pings are currently closed.